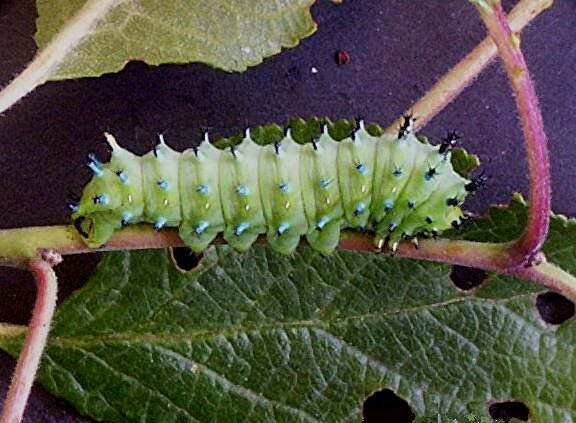 Actias dubernardi is a rare species of Saturniidae. This specimen was bred by my brother Åke. Dubernardi larvae are feeding here on Pinus silvestris L.
The machaon machaon female, here shown, is somewhat larger than the male and has more rounded forewings. Parnassius mnemosyne hartmanni female. Its black appearance is unusual. June 11. Hyalophora columbia male just emerged. This species is normally breeding in North America. Brahmaea hearseyi female just emerged from its pupa. This is a really a huge, extremely patterned moth. Breeding extension: South East Asia. June 12. Brahmaea hearseyi larva, almost full-grown. In captivity the larvae accept well leaves of Ligustrum. June 24. On June 13 a bred Mimas tilae female emerged. It was set out in the forest in a pairing trap. This morning the result was as shown above, a wild male had mated her. June 14. Parnassius phoebus sacerdos larva on Rhodiola rosea. June 21. Parnassius phoebus sacerdos female imago. This ssp of phoebus is breeding in the European Alps. July 10. Parnassius a limicola is a huge ssp from the Urals. This is a male specimen. July 10. Parnassius a onarani pair mating- Ssp onarani is a recent discovery in 1987 from Turkey. Cosmotriche lunigera larva nicely patterned, here on Picea abies Linnaeus. August 19. Hyalophora columbia on Prunus. August 25. Dasychira pudibunda larva in forth stage. August 26. Hyles vespertilio male just emerged from its pupa. .